Now that you have shredded all of you important papers, you may be wondering how best to recycle all of those bits and shreds. This is a guide about recycling shredded paper. What do you do with your shredded paper? Do you recycle it? Compost it? Burn it? Some pet stores take it for their Hamsters, Gerbils etc. It's good for weed control also. Try calling your local animal shelters also. If I had access to shredded paper, I'd use it as filler in the bottom of a gift basket, and then fill the remainder of the basket with the prettier shred on the top around the products. RE:Shredded paper, if you have flowerbeds, sprinkle it on top of your soil, wet down. Try to put a little soil on top of it. If that is not possible, just leave it on the soil. Mix into existing soil. It deteriorates quickly. It is good for the soil as long as you do not have any plastic shredded in with it. You can mix it into the soil of flowerpots too. Also, place some in baggies and store for when you need packing for boxes that are to be shipped or stored. In addition, same above process for storing delicate Christmas items. I use it for gift packaging but also for postal packaging. It could also be used for assorted crafts like paper mache. If you aren't a crafter you could donate it to schools and senior citizen homes for their crafting uses. We use it to make briquettes for our wood burning stoves. We bought a briquette form and have saved a lot of money on wood for the stoves. This year we figure to have around 50 hours of free burning thanks to collecting shredded junk mail and newspapers from our friends to add to our own household junk mail shredding and newspapers. I use a layer of newspaper in the bottom of my compost bucket. It decomposes as quickly as the kitchen scraps and makes it easy to clean out the bucket. I've used it for packing when sending off packages. Most of it winds up in the trash burning barrel. If you have babies, use it in the stinky diapers. It may make it stink a little less. Get the smallest shred cut available. That way no one would want to try to reassemble it. Can shredded paper be put in with regular recyclable paper? Maybe put in a paper bag and stapled? Or does it need to be thrown out with regular trash? 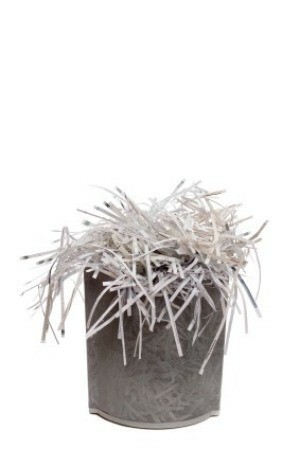 Shredded paper can be put in with the regular paper, however just be sure not to put it in a plastic bag! A paper bag should be fine and a few staples will not hurt the recycling process.